I've been avoiding this for years, but here I am. As we pass through 800 feet over the Nimitz (a local freeway) my instructor John Ewing makes me don what I'm quickly coming to think of as the Cone Of Stupidity, then tells me to turn to heading 340 and climb to 1,800'. Simultaneously Oakland Tower hands me off to NorCal Approach on 120.9. Piece of cake! I say sarcastically as I blow straight through 340 to about 360, and unconsciously level off at about 1,000' while calling NorCal -- and getting our tail number wrong. At least I noticed I'd gone to 360. And that I was hundreds of feet below my target altitude (failure has its own sort of clarity, I guess). This isn't going to be the easiest flight I've ever had. About a month ago I finally decided I had enough time and money to start training towards my instrument rating. I did my basic private pilot license (the "PP-ASEL", in US jargon) a few years ago now, and I'd spent the next few years doing almost anything else -- aerobatics, getting tailwheel and complex endorsements, etc. -- to avoid doing the instrument rating. The rating is hard (many pilots will tell you it's the hardest thing they've done), and it takes a lot of time and effort, and I didn't want to start something and only be able to pursue it half-heartedly or have to drop out because of time or money issues (which may still happen anyway -- we shall see...). So I got in touch with John Ewing, a club instructor who I've know for several years now, and arranged to be his student for the foreseeable future until I either got my instrument rating or I had to drop out for lack of time or money. Until you do it, it is easy. But that tiny little artifical horizon -- the attitude indicator or AI -- doesn't give much away, and is a poor substitute for the real thing. I don't seem to have the problems some other beginners have with vertigo or an inability to believe the instruments, I just don't react quickly enough to what the instruments are telling me, and I haven't internalised how to correct the various trends as they emerge on (say) the heading indicator or altimeter. At one point I actually mentally reverse the sense of the AI and treat it like the turn coordinator; if I did this in real IMC and didn't catch it quickly, it could be lethal. Luckily I recognised it before John would have had to save us, but it's a sobering experience. So we weave about over the Bay for another thirty minutes or so, with John giving me vectors, headings, altitudes, and turn instructions -- just a typical beginner instrument student workout. Nothing really terrible happens, but the entire time I'm under the hood my flying is hopelessly imprecise. I don't ever lose control or cause John to take the controls, but I feel humbled by how badly I followed headings or altitudes. As we're vectored to join the localiser, the workload once again starts shutting my poor little brain down. "It's alive!" I think, as the localiser needle starts slowly moving off the left peg towards the vertical. But now what? My brain tells me I should do something, but another part of me says "he said heading 250, so keep that heading". Mistake: I know -- somewhere in that IQ-80 brain of mine -- that once I start intercepting the localiser I should turn into it rather than keep on the assigned heading -- but I just sit there stupidly. Somewhere in the right seat John's trying to tell me something, but I don't know what it is or why. Urgh. I slowly sort it out and we fly the ILS down to a normal landing on 27R. Even though I wasn't under the hood at this point, I don't think I saw a thing outside the plane -- just the needles and the various other instruments. At the decision altitude, John makes me look up -- and there they are: the runway lights, not quite dead ahead. Cool! As yet another step on the way to becoming a career pilot, usually just before doing their commercial rating then becoming a CFI. As a way to be able to fly when the weather's not nicely VMC -- an instrument rating greatly increases the scope for flying, especially in a place like Coastal Northern California, with its coastal stratus. As a way to improve their flying skills and safety levels in general. For me, the first reason doesn't really apply (although I'll admit that I have this sneaking desire sometimes to become an instructor or a lowly freight dog... we shall see). The second reason's a particularly strong one around here -- for months on end during summer, late spring, and early autumn the coastal fog closes Oakland airport (my home base) to VFR for hours of each day, sometimes all day. It's clear ten kilometres inland, and 1,500' straight up, but you need that IFR clearance to get out safely and legally. And yes, I'm one of those who believes that an instrument rating helps in all aspects of flying, and not just because you get better at holding altitudes and headings, or because you can cope with suddenly not being able to see the horizon or the ground. You get a better understanding of the system as a whole, and a better insight into what other pilots and planes are doing or thinking, and why. But the real reason -- as with learning to fly in the first place, and starting aerobatics training -- is simply curiosity. What's it take to get an instrument rating? What's it like? Can I do it? Etc. I'm more motivated by pure curiosity than most people seem to realise. It's officially called "the hood", but I've come to think of it as the cone of stupidity -- as in "lower the cone of stupidity!" -- because of the effect it seems to have on my IQ every time I put it on. You typically wear the Cone Of Stupidity during practice instrument work, and its main effect is supposed to be to block out any external visual clues (like the horizon) to simulate flying in zero visibility. All you can see with it on is the instrument panel, more or less. But its real effect -- on me at least -- seems to be to block the capacity for sustained thinking, and to lower my IQ to about the OAT in Celsius. Things that are simply obvious under normal VMC flying conditions -- the mental arithmetic needed to work out a course interception, or what side of the plane an NDB is on, for example -- start feeling like mammoth feats of intellectual effort under the hood. An hour of simulator time on John's Elite at his house in Berkeley. Before starting, we walk through the cold down to Lola's on Solano Avenue to get something to eat. I mention to John that I'm doing interior photo shots at Cugini literally straight across Solano for a client; he tells me that John (yet another John...) behind the counter here at Lola's -- the Boss -- used to work for Cugini before starting Lola's with his wife. Small world. They're not really in competition (Lola's is far hipper, much smaller, and basically a take-out only place) but I'm not going to ask whether John and the Cugini (who are acquaintances of mine) still talk -- from long personal experience, the East Bay food world is incestuous and riven with bitter feuds and populated by drama queens... (OK, thanks for asking: I'm mostly affiliated with Mezze and (in the early days) Bucci's. No more restaurant shoptalk here, I promise). Anyway, I do OK on the simulator, but nothing better than OK. Towards the end I have that familiar feeling that my brain's about to explode -- I can always tell this by the fact that I can't answer even the simplest of John's questions. At one point as we're heading up the Bay he asks me a question about radial intercepts that I could normally answer without much thought while flying a "real" plane in VMC. I could barely work out what he was asking this time, let alone give him a plausible answer. Oh well. This time the sim feels realistic in roll and yaw, but really unstable and "wrong" in pitch (pitch trim was unusable for me; I need to work out how to use the fake trim on this). I blunder about the simulated skies losing a few hundred feet here, a few hundred there, without always noticing. At least I keep the heading within about 20 degrees of what it should be for most of the flight. I almost lose control of the "plane" a couple of times, but nothing that would cause a real emergency. At least I always knew I was rapidly losing altitude or whatever. On the way back John gets me to fly the OAK VOR / DME 27L approach, but without me knowing this is what we're doing. I slip and slide all over the place, horizontally and vertically, and at one point misread the altimeter and level off at 2,600' rather than 1,600'. Urgh. At least it wasn't the other way around. On short final into Oakland's 27L I get so frustrated by the weird response of the sim I deliberately try to roll the plane at about 100' AGL. No such luck -- the poor thing predictably just noses into the ground at a high rate of knots. This isn't like 36B, I guess. A cool, cloudy morning in Oakland, with rain forecast for much of the Bay Area. 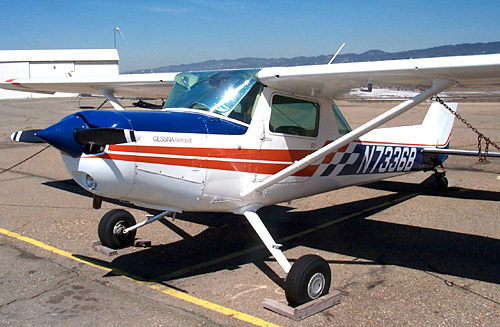 The plan is for Ben and me to take 36B out to Tracy (KTCY) to introduce me to aerobatics in Cecilia Aragon's Super Decathlon -- a sportier plane than 36B, and (as Ben puts it...) "a real taildragger, a real aerobatics plane". The weather looks ominous to the north with heavy rain showers over Berkeley, but by the time we're over the Diablo and Livermore Valleys it's fine, just some nice scenic little fluffy clouds here and there (and I end up being unable to put that damn The Orb / Ricky Lee Jones track out of my mind for the rest of the short flight). The flight out to Tracy goes well, and we tie 36B down in the vast parking area in front of Tracy Flight Center, the FBO. It's quiet out here -- a decent-sized airport, but without much traffic -- and the TFC staff are friendly and efficient. They know Ben well, and help us get the Decathlon out from the FBO hangar with a minimum of musical planes. I meet the airport cat, a friendly thing variously named "Missy" or "Six" (she has six toes), who's locally famous for actually enjoying being taken for short flights. She strolls purposely past us onto the ramp towards the turbine Twin Commander near the fuel pumps. There's an official aerobatics box just to the immediate southeast of the field, but we'll be doing our aerobatics in an informal box a few miles further to the south east (the formal box is too low for non-competition work, with a ceiling of only 3,000' and floor of 500' -- I'm not comfortable at the moment below 4,000' AGL). We taxi to 30 and I take off, a bit unsure of what's going to happen. But the Decathlon's a revelation: responsive, fast, easy to maneuver, relatively powerful (with that 180 HP engine), and a delight to fly. The constant speed prop helps a lot with aerobatics -- just set (the RPM and manifold pressure) and forget, unlike with 36B where you spend a lot of time pulling and pushing on the throttle with the fixed-pitch prop to ensure you don't redline the engine in a dive. The Decathlon has a stick rather than a yoke, and tandem seating; I start out thinking I'm going to find the stick (and the throttle placement at elbow height on the left side "door") weird and difficult, but except for a tendency to over-control in the first few minutes, I found the controls responsive, intuitive, easy to use, and -- for whatever reason -- easier to correlate with what you see outside than a yoke system. After a few minutes of doggedly watching the ball and turn coordinator, I just watch the horizon and fly by feel. Much easier -- and the way it should be. On the ground, the Decathlon doesn't have 36B's tendency to wander unstably from side to side at high speed (leading to that 36B rudder dance and great potential for ground loops...), and in the air it has much more rudder and elevator authority than 36B. Again, this means I tend to over control at times, but it's a more intuitive plane to do aerobatics in than 36B. The 180 HP engine is also a lot more powerful than 36B's 110 HP (but still way underpowered compared to, erm, real aerobatics planes...), and I'm surprised at how easily it climbs -- in fact, we actually slowly gain altitude through the series of maneuvers, when in the same situation in 36B we'd lose several thousand feet over a few minutes. The Decathlon could get addictive... if it weren't so expensive to rent. In the informal box I first try a tentative aileron roll, just to see what happens. Well, nothing much bad happens, but the results aren't pretty because I'm still a little unused to the sight and the controls. But from the second roll on, throughÂ a series of rolls in both directions, loops, barrel rolls, hesitation rolls, half Cubans, etc., singly and stitched together ad-hocly over about 25 minutes, it's all really enjoyable and (mostly) under my control and not too inaccurate. Cool! One thing that bothers me is that I'm ambidextrous (or rather, very weakly left-handed), and my instincts are to fly the stick with the left hand. But in the Decathlon you have to use the left hand for the throttle and other engine controls, and through the first few figures I find it unnatural and quite "wrong" to use my right hand. What happens over the next few minutes is apparently typical -- I end up using both hands in maneuvers, the left clasped around the right. This gives extra leverage, and since the constant speed prop looks after itself, it works nicely. I don't even notice I'm doing it until about half way through the session. In level flight I still have to fight the urge to grab with my left hand, but I'll get over it eventually. Then we try sustained inverted flight. You can't fly 36B inverted for more than a second or two because its fuel and oil systems aren't designed to work when the plane's upside down -- it's all gravity-fed. The engine just sputters to a stop (and restarts immediately you go upright, luckily enough). But the Decathlon's built for inverted flight -- and it has near-symmetric wings to help with this -- and I'm up for it. Intuitively it's easy, but in real life it's surpisingly difficult to overcome the urge to pull the stick back and split-S down and (dangerously fast) back out the right way after a couple of seconds. It takes significant forward stick pressure to sustain inverted flight once you've rolled inverted, and with all the control effects reversed, hanging there against your straps with the windshield full of an upside down world, things can get a little disorienting (a tip from personal experience: it's also quite uncomfortable unless you've strapped yourself in really tightly). I try this about four times, with the last two attempts being pretty successful, sustaining in both cases about ten or 15 seconds inverted, level and stable (this is a lot longer than it sounds when you're actually doing it...). Cool! This could also be addictive.... One of the more popular tricks is apparently to roll inverted a few hundred feet AGL on departure and fly inverted to the aerobatics box. I don't think I'll be doing that anytime soon, but it's something to aim for one day... maybe. After about 30 minutes of aerobatics we return to Tracy, where I embarass myself by lining up for 25 rather than 30 on downwind (D'Oh!). Ben gently points this out, and I get on the correct downwind. I feel really stupid -- I haven't done this for years (not since I was a student, I think). My pathetic excuse is that the Decathlon has no heading indicator, so I didn't do the usual HI vs runway heading sanity check before joining the pattern. On base and final I start obsessing about the landing -- an unfamiliar aircraft (with no flaps!) and a tailwheel at that. But it all goes fine with Ben talking me down, and I do a decent full-stall three pointer on 30 without killing anyone or breaking anything obvious. A lot easier to land cleanly than 36B, again mostly because of the better control authority and stability, but also because the landing gear feels a lot less springy. An observation: the stick overcomes the tendency of bad pilots like me to use the yoke as a steering wheel on landing (the bane of instructors everywhere); this can't be a bad thing. The return flight to Oakland in 36B is uneventful. Over 580 near Livermore I watch a couple of radio-controlled model airplanes doing aerobatics on the little RC field a few thousand feet below us. Tiny things, they buzz (I can almost hear them...) around quickly and seemingly randomly, but easily visible from our altitude. My guess is they're actually a lot harder to fly accurately than a Decathlon or Aerobat, if only because everything's done remotely and things happen so quickly. Apparently there's a whole genre of model airplane aerobatics -- at least judging by the results when you Google for specific aerobatics terms: the top page or two of results typically point mostly at RC aerobatics pages). The landing on 33 at Oakland goes well -- a standard full-stall three pointer -- until about a second after landing when we suddenly billow several feet back into the air, even though the yoke is fully back and we landed stalled. I firewall the throttle and stabilize the aircraft at about 5 feet AGL, then re-land a few hundred feet further down 33 with yet another three-pointer. This time it sticks. I look at Ben to see what I did wrong, but he looks as surprised as I am -- I didn't do anything wrong this time, maybe we just got hit by a freak gust? Odd. This time, though, I have my own business, and I have much less time and money than I did when I was doing the private pilot certificate, so I may have to defer training for a while every now and then, or suspend it completely for months on end. There may be long breaks in the blog as this happens (although I'll typically announce that this is happening, of course). We shall see... (as I keep saying). John owns a complete Elite simulator, which he uses to help train instrument students like me. The Elite differs from my own little On Top simulator (or MS FS 2004, for that matter), by being approved by the FAA for training and (crucially) logging against required hours, and in its supposed levels of accuracy and fidelity to The Real Thing. The other main difference is that it has a full physical stack of switches and dials, so you change frequencies or set the OBS (etc.) pretty much the same way you would in a real plane (this is part of the FAA certification), unlike with a mouse the way I have to do it with On Top (the difference is pretty important when you're doing a complex maneuver or approach). The Elite works on a decent PC with the added hardware connected through USB -- i.e. (like On Top) it's not one of those airline simulators with physical movements, and it's not trying to do fanatically accurate rendering of ground detail, etc. (which would be lost on the average instrument student who only really cares whether he or she can see the runway at the end of the approach). The Elite has two obvious advantages -- it's cheaper (John doesn't (yet) charge for flying it, only for instruction while I fly it), and it lets you set up all sorts of emergencies, approaches, weather conditions, etc., at the click of a mouse. You can do a hell of a lot in it -- like flying a complex approach to minimums while nursing a sick engine or failed AI -- that you couldn't do safely, or at all, in a real plane. And you can stop the bloody thing mid-approach and talk over what's going on or what I just missed, etc. The inevitable disadvantage is that it's not a real plane, and doesn't really fly like one. It's better than my On Top, but it's still unrealistic in pitch and heading, and with no force feedback at all on the yoke, very difficult to trim accurately or to simulate things like sharp turns, etc. It's also weirdly unrealistic on final and landing -- I have literally hundreds of landings in real aircraft behind me, but none of them has never been anywhere near as hard as it is to land the Elite. Many times I don't even try -- the sensation of hanging there swinging helplessly a few hundred feet above the runway with almost no effective elevator or aileron control just frustrates me intensely (I usually try a victory roll at this point; if I ever persuade it to do that properly, that'll be a victory of sorts...). A semi-frustrating morning spent doing cloverleafs, barrel rolls, Immelmans, and sundry other maneuvers in the Diablo aerobatics area in 36B with Ben. Something’s wrong with my aerobatics flying today  nothing specific, and definitely nothing drastic, but I keep making minor mistakes like not applying enough top rudder in the Immelman pull out, or rolling too slowly in the initial part of the barrell rolls, or coming out on the wrong heading. After about 30 minutes of this, I give up and we head back to Oakland. In the background on the Bob Channel two guys  one with a heavy South African accent  spend the best part of twenty minutes slowly discussing Mozambique, South Africa, Placerville, the new Garmin 1000, and other assorted subjects as they (presumably) plod across the Central Valley as a flight-of-two. Earlier, just after the runup, John plays Clearance Delivery (which ain't like playing Deliverance) while I take down a long clearance from him. This time I get it all down legibly, but I regurgitate it from memory ... backwards, starting with the transponder code and ending with the clearance limit. Seems I do this for VFR clearances as well -- it goes in one way, comes back out like a popped stack. That's the way I remember the clearance elements, unfortunately. I'll have to work on this -- my response would have driven any controller crazy, even though it contained all the right individual elements (just in reverse order). For VFR, it doesn't matter much -- clearances tend to be short and uncomplicated, and I suspect controllers are just being polite to the guy-with-the-funny-accent; for IFR, I just need to actually read the damn thing back rather than memorize it, I guess. D'Oh! More aerobatics with Ben in 36B: precision spins, cloverleafs, rolls, loops... the usual. This time, a lot of fun, but still a little off with the headings on the cloverleafs. I can't seem to see the correct heading on pullout, and can't stitch more than two quarter-cloverleafs together without losing my heading and positional awareness. The precision spins -- where you state before-hand exactly how many turns (e.g. 1, 1.5, 2, 2.75, etc.) you'll do in the spin -- are truly enjoyable, and go well. I used to dislike spins because of the disorientation, but nowadays I love the little thrill of the kickover, then watching the horizon twist and then spin over and around you. 36B spins steeper than most aerobatics planes -- perhaps 60 to 70 degrees off horiziontal -- so most spins end with you loooking almost straight down at a swirling ground (and the steepness gets emphasized with the sharp elevator kick just before full recovery). The trick is to be able to pull out on the nominated heading -- which is difficult for the first complete turn or so, when the plane hasn't really established the spin, and landmarks on the ground aren't obvious enough to use. It becomes a feeling / timing thing for the first full turn or turn and a half; this time, at least, I had no trouble doing the mental timing an estimation. After the first turn you typically have your choice of ground references to use, and things are easier. Nothing at all to report on the Bob Channel except a little coordinating to-and-fro between us and one of Attitude's planes doing aerobatics a few miles to our northeast out of Livermore. (i.e. exactly what the frequency's there for). I use ASA's "On Top" simulator at home. It's not bad, but it's no Elite, at least not as set up on my PC. I bought it a week or two after deciding to do the instrument rating, and it's been a real help for internalising approaches, procedures, and instrument scanning, and generally just seeing what happens when I push this or try that. Why not use MS FS 2004 or X-Plane? Frankly, because those programs have both too many and too few features. An IFR trainer really doesn't need fanatically-detailed ground texture rendering, but it needs to be able to display and understand every VOR, NDB, ILS, LOC, fix, IAF, FAF, GPS waypoint, etc., in the area you're interested in. It needs to support an interesting variety of programmable instrument failure modes, and a decent repertoire of weather conditions (especially changeable conditions of the sort we simply never see in real life out here on the Left Coast). And it needs to be relatively accurate in flying characteristics, and cope with a yoke rather than a joystick (that's a given for IFR training). People often ask how my original instructor Dave Montoya is, and sometimes even ask for a referral. Unfortunately, David died suddenly and very unexpectedly a couple of years ago, leaving a wife and small child -- and a lot of mourners -- behind. I didn't believe the news when I first heard it and it took a few weeks to confirm that it had actually happened. I make no mention of his death on my original flying site because I don't want to spoil the effect there. Dave was an excellent instructor, very good at judging the often very different needs of each student, and varying his teaching methods accordingly. He suited my own way of learning very well indeed and I enjoyed the time I spent flying with him or having coffee at Javarama, etc. I think I most miss his sense of humour and optimism about his students, and the way he absolutely enjoyed teaching. He held an ATP and had flown in the regionals, but returned to teaching because it suited his lifestyle and temperament better. He was teaching at Palo Alto at the time of his death; he'd just returned from a stint in Vermont, where he'd quickly got sick of shovelling snow and flying with taciturn Northeasterners. Amongst those who knew him well, he's still missed a lot. Greater Green River Intergalactic Spaceport, Wyoming (48U). Runway 4/22, dirt, in poor condition: "ROUGH; DEBRIS FULL LENGTH OF RY; BROKEN BOTTLES & FIREWORKS DEBRIS." More DME arcs on John's Elite, this time incorporating a real approach, the Watsonville (KWVI) VOR/DME A approach. The first approach (using JEJZE as the IAF from V27 via SHOEY) goes well, except I forget to turn the OBS correctly on entry. Not that it really mattered much at that point, as I kept on the arc with the DME and turned it to the exit radial at the right place, but I knew something was missing, and it bugged me until that D'Oh! moment just before I turned the OBS to the final approach course (the Salinas 314 radial). D'Oh!, indeed. I break out at 1600', a few hundred feet above circling minimums, and see the runway straight ahead. Continuing what's becoming a tradition, I just can't take the landing phase seriously -- the damn sim just isn't anything like a real plane at this point -- and try a slow speed victory roll after circling successfully to line up with runway 26. Bang! As we debrief the approach John asks me if there'd been anything odd about the instruments. I didn't see anything obvious -- the AI, HI, TC, fuel, etc., instruments all checked out throughout the approach (I'd kept a good lookout since John had warned me earlier that he'd fail a few things at some point this evening) -- so John has to point out the failed alternator. D'Oh! Again. I should have picked up on this -- I've actually had a real alternator failure at night in a real plane, which was a bit of a non-event in VMC -- but I missed it completely this time. John sets me up for a second attempt at the same approach, this time from the other side using JEJMA as the IAF. No problem, I think, but I can hear a lot of mouse clicking in the background. What's he going to fail this time? I start expecting to see the AI go belly-up as I start the DME arc, but there's nothing obvious. Then suddenly an annunciator on the panel tells me there's an oil pressure problem. Sure enough, when I look at the gauge, there's no real pressure and the temperature's way high. Not what I expected at all. I don't panic, but all I can think of doing is declaring an emergency. I do so, and forget the first rule of emergencies: fly the bloody plane! I lose the plane for a few seconds, losing altitude, gaining airspeed, and generally swerving about all over the place. With a bit of prompting from John I regain control, and John -- playing NorCal -- asks my intentions. I haven't thought this through at all, and I'm totally unprepared. Argh. John sits there poker-faced. My instinct is to keep going on the approach, but stay as high as I can until I'm close enough to the airport to make the runway. But some part of me thinks "I know the area down there -- maybe I should descend beneath the cloud layer immediately and look for a nice field to land on" (there are a lot just down there -- local knowledge helps in situations like this). But I tell "NorCal" that I want to continue the approach, with any assistance they can offer me, and that I'll stay high until well past the final approach fix. John ("NorCal") vectors me to the final approach course and despite some very rough heading and altitude changes here and there (I don't want to use the engine unless I have to to do anything more than maintain an altitude) I actually break out in the right place at roughly the right time and attempt to land. John fails the engine completely on short final and I "land" badly. But it looks like I survived. I feel exhausted. John suggests I take his place and fail a few instruments as he does the same approach in the Elite's Seminole (a twin). Cool! I set him up for the approach, then as he takes control I fail the cylinder head temperature on the left engine. John spots it immediately and goes through the emergency engine checklist, shutting down the left engine and generally keeping control. So I set both the ADF and the VSI to fail in a few minutes, and wait to see what happens. Not much -- John Keeps control nicely, and shoots the approach. But at minimums we can't see the runway at all. A nightmare in real life: going missed on one engine in real IMC. This is what sims are for... so John goes missed, and I ask what his intentions are. I comment that I'd probably head for the ILS at Salinas, but he points out that that would be a huge diversion, and decides to ask for the ILS runway 10R approach into Monterey (KMRY), an airport I'd completely forgotten about, and only a few tens of miles away. After a bit of cursing at the Elite's dismal GPS simulator, and a discussion about how to initiate this approach in actual with a dead engine, this approach goes much better, and John breaks out with 10R in sight dead ahead. Cool! This instrument training diary documents one person's attempt to get a US instrument rating in Northern California. You can read a full introduction here. Hamish Reid is a photographer, designer, and software engineer living and working in Oakland, California. His full blogger profile is here.